Locate the surgical cover screw (healing cap) freely floating inside the sterile pouch. Using the 1.25mm Hex Tool, carry the screw (healing cap) to the surgical site and thread it into the implant. 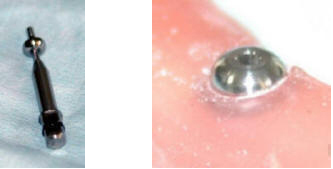 Standard 2mm cover screw/healing cap is included with every implant.